Remote employees, or those that work from home, are an increasingly important part of many companies. This article in the New York Times points out that 43% of Americans spend at least some time working remotely. No longer do managers imagine employees in pajamas occasionally checking emails. Remote work is now a viable solution to many issues plaguing workplaces. Chief among these is a decrease in need for office space, which equals less overhead. With less employees to house, your space requirements go down. To add to this, the fact that these employees aren't in an office increases their productivity. They work longer and are less distracted by the donuts in the break room or lengthy lunch breaks. There is no traffic to eat into their day, either. Another benefit employers see is a decrease in sick days. Working with a cold is doable if you’re in the comfort of your own home, and no one is sharing germs. An article on Inc.com by Amanda Abella explains that employers lose $225.8 billion annually due to employees calling in sick. This just isn't a concern for remote employees, barring serious illness. In fact, work that would otherwise be left incomplete if say an employee's child is sick, would more likely be attended to if that employee can simply log on and finish it. Additionally, working from home offers flexibility in a time where work-life balance is a crucial aspect in retaining talent. Employee turnover costs companies in many hidden ways. According to author Suzanne Lucas, this can come in the form of lowered productivity, overworked remaining staff, knowledge loss, as well as training, interviewing, and recruiting costs. In her article, Abella gives some interesting statistics that prove that improving work-life balance through a program such as remote work helps retain employees. She cites a Flexjobs.com survey that revealed that 72% of respondents said that work-life balance is the top thing they look for, and 32% said they'd already left a job over lack of flexibility. Of note is that 79% said they would be more loyal to an employer if they offered more flexibility. Working from home = flexibility! 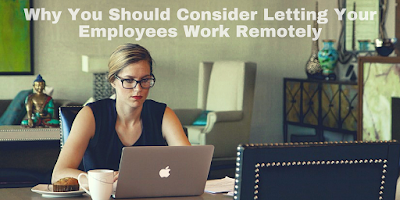 Ready to implement remote work at your company? This article by Anna Johansson for TriplePundit.com offers some steps you can take to get started.